One of the old names for the Korean island of Ulleungdo in Korean historical documents was "Sambongdo" (三峰島 - 삼봉도), which means "Island of Three Peaks." Ulleungdo's three prominent peaks were mentioned numerous times in Korean historical texts. Though some nationalistic Korean historians claim that Sambongdo was referring to Liancourt Rocks (Takeshima - Dokdo), Korea's own historical texts, and, apparently, even the symbol for Korea's Ulleung County (울릉군) seem to contradict that claim. The oval shape of the outer edge of the symbol represents the sun rising over the East Sea (Sea of Japan). With Ulleungdo's Seongin Peak in the center, the shape of the mountains is shown with a design of three triangular peaks that represent Ulleung's unyielding spirit. 가장 자리를 둘러싼 타원은 동해에 떠오르는 태양을 상징하며 산의 형상은 울릉도의 성인봉을 중심으로 울릉의 굳굳한 기상을 삼각형태의 대칭구조로 2분하여 도안 되었습니다. The Korean seems a little awkward to me, so if someone has a different translation, please let me know. For example, I assumed 굳굳한 meant 꿋꿋한. Also, the expression 2분하여 seems awkward to me. 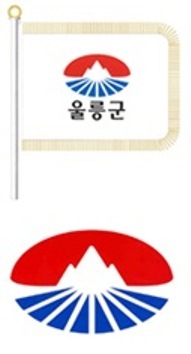 Again, the three peaks of Ulleungdo were mentioned numerous times in Korea's historical documents. Thanks, Chaamiey, for pointing out the symbol. A Dae Dongyeojido (大東輿地圖 – 대동여지도) map showing Dokdo has been discovered domestically for the first time. 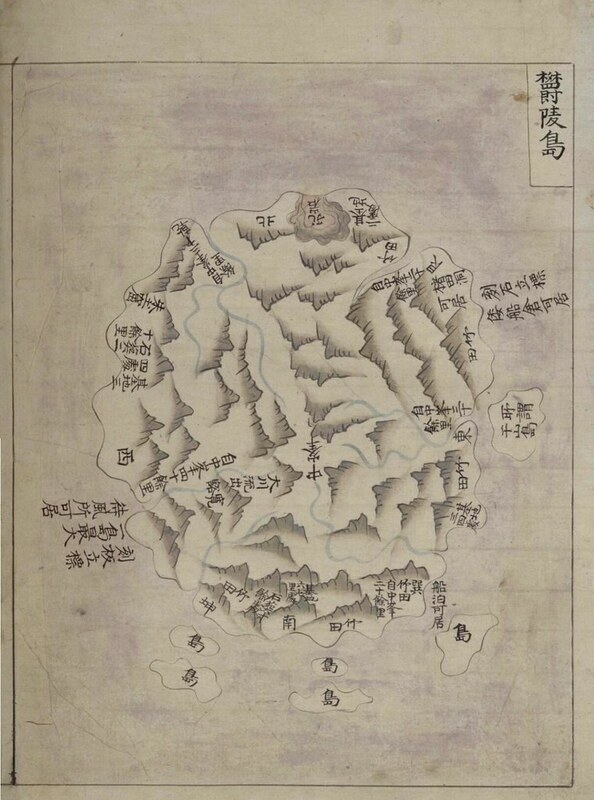 On the 11th, the Academy of Korean Studies revealed, "In November of last year, while researching old documents as part of an effort to promote Korean Studies, a hand-drawn copy of a Dae Dongyeojido map showing Dokdo was found in Seoul's Seodaemun District Korean Research Center library. 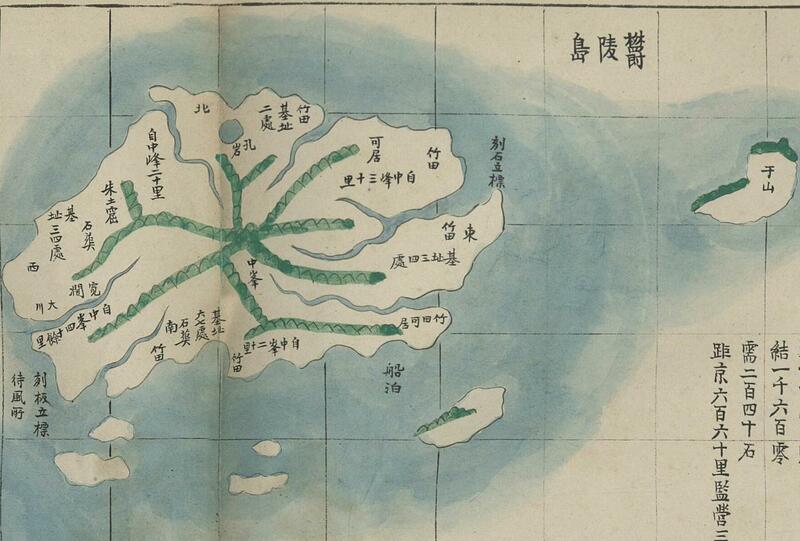 On this handdrawn copy, an island labeled "Usan" (于山) was drawn to the right of Ulleungdo. 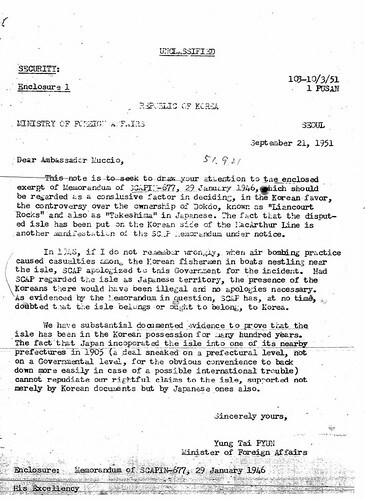 Usan was the old name for Dokdo. 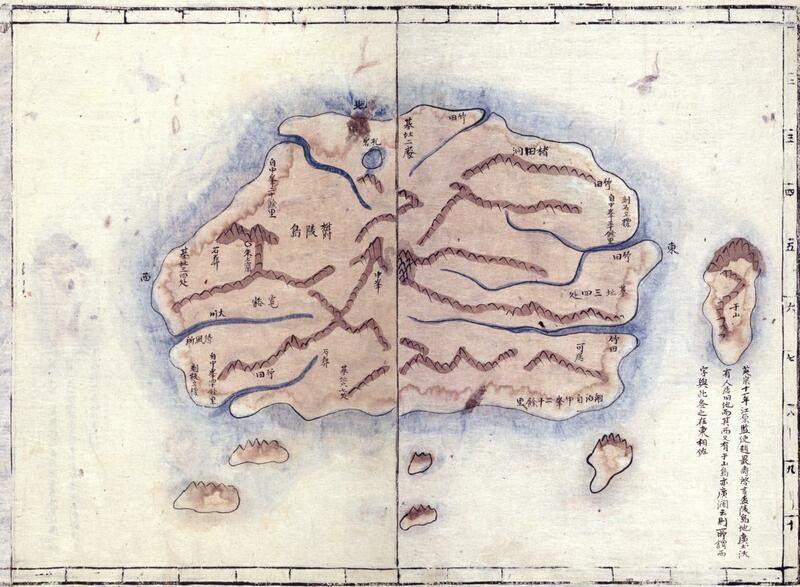 The sea was drawn blue and the islands were drawn yellow. Worldwide, there are a total of 25 block-print or hand-drawn copies of the Dae Dongyeojido. As for copies showing Dokdo, until now there was only a block-print copy in Japan's Diet Library, none had been found domestically. In the block prints, Kim Jong-ho, himself, craved the map on the blocks in 1861. 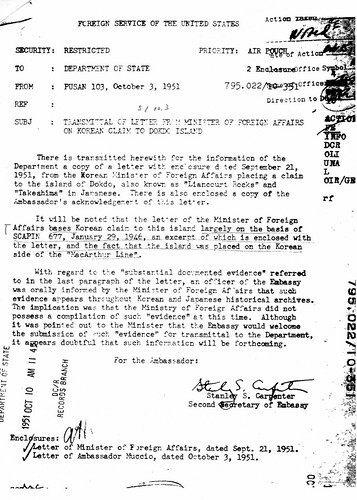 The hand-drawn copies were made by placing paper over the original blocks and tracing them. 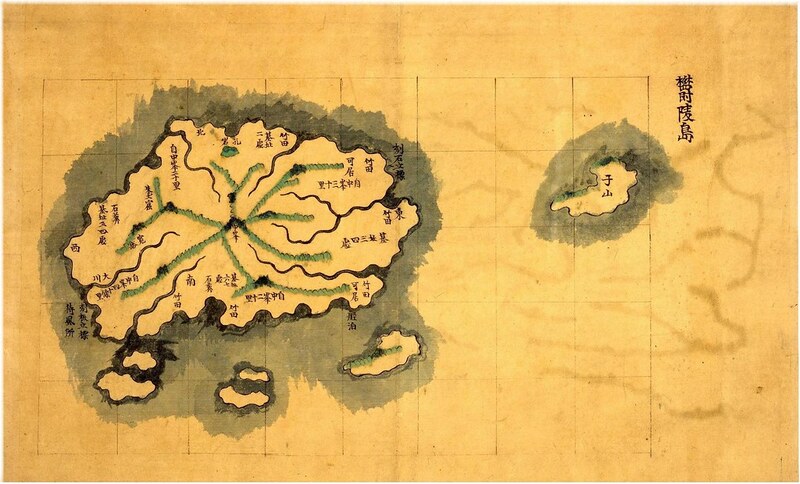 The Research Director of the Academy of Korean Studies, Ok Yeong-jeong, said, "A hand-drawn Dae Dongyeojido map showing Dokdo is important for understanding how Dokdo was seen by Koreans in the 19th century. 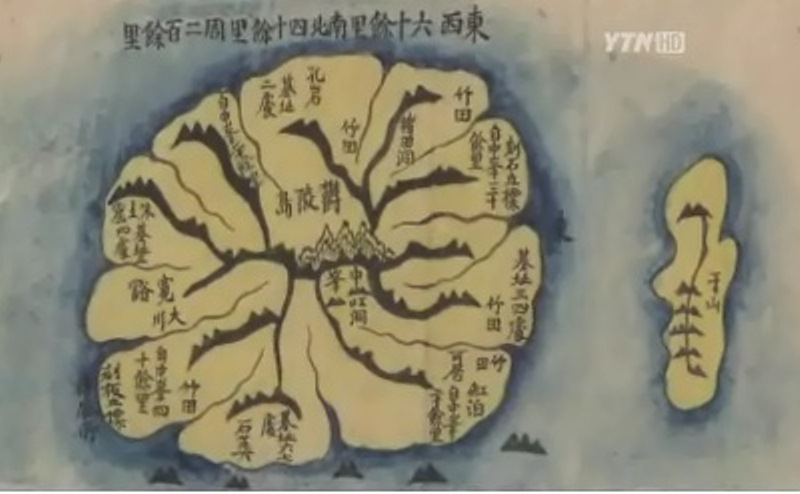 Lee Sang-tae, an endowed professor at the Graduate School of Korea International Culture University, explained, "Japan has claimed sovereignty of Dokdo by saying 'Dokdo has hardly appeared on a Dae Dongyeojido, which is Korea's representative map,' but the discovery of this map has confirmed that claim is groundless." Above Ulleungdo on the map is written, "In the 11th year of Yeongjong, Gangwon Gamsa Jo Choi-su inspected Ulleungdo, and Usando is to the east of Ulleungdo." 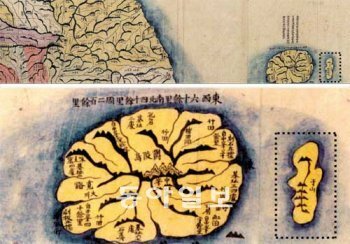 Concerning this, Professor Lee explained, "Until the Daehan Emprie was established in 1897, King Yeongjo was called 'Yeongjong,' so this hand-drawn map was drawn sometime between 1861, when the Dae Dongyeojido was first made, and 1897. Thanks for the link to the article, Chaamiey. 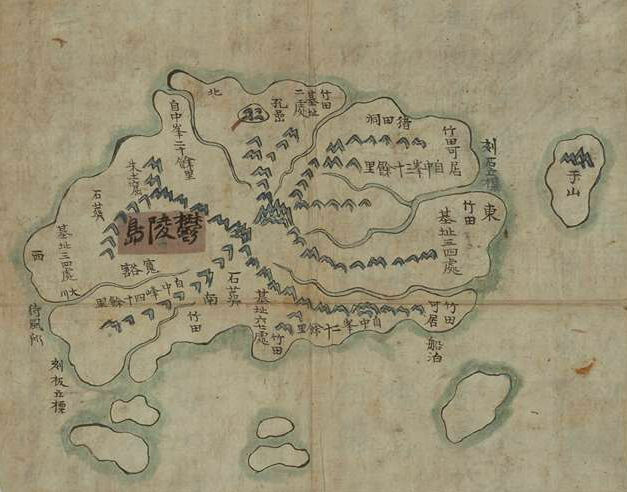 Besides the Dae Dongyeojido shown above, Kim Jong-ho also drew the following 1834 map of Ulleungdo and Usando, a map which has gridlines for distance along the edge. Each gridline represented ten ri, which was about four kilometers. The gridlines prove that the Usan (于山) on the map could not have possibly been Liancourt Rocks (Dokdo), which are are about 90 kilometers southeast of Ulleungdo and are essentially made up of two rock islets, not one.